Moving Past Mainstream. Ordinary VDP is No More. Variable data printing (VDP) is mainstream. The introduction created a new breed of print provider, the marketing service provider (MSP). At its inception, data specific to the recipient in a multi-channel marketing campaign was exciting and new. Today, marketing materials, mailing pieces, and landing pages are easily customized to the intended reader. Customers expect MSPs to offer VDP capabilities. To keep pace with demand and stand out from the competition, MSPs must mine quality data, track response rates, and provide customers with results. This occurs by taking reliable solutions and leveraging the best features to offer interactive, multi-channel events. Above: XMPie’s print and digital media touchpoints are driven by its PersonalEffect personalization and composition engine. Changes in demand for VDP have MSPs revamping their business models. “Personalization alone doesn’t cut it anymore. 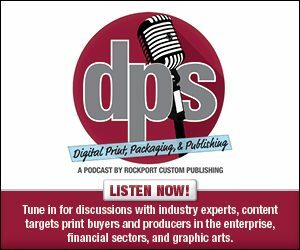 The consumer expects it and the novelty has worn off—to stand out from the competition print providers and MSPs need to use VDP as part of an integrated omni-channel campaign,” admits Josie Stein, marketing and communications manager, XMPie Inc., a Xerox company. Data collection is one requirement. “Customers demand return on investment (ROI) and need to report on it. Combining VDP with electronic communicating and landing pages increases ROI while allowing for tracking results,” shares Dino Pagliarello, VP, product management and planning, Konica Minolta Business Solutions U.S.A., Inc.
Pagliarello says many Konica Minolta customers conduct A-B testing. By splitting the data one or more times with modified messages, they track and report the results and amend the campaign to the message with the best results. “More companies use VDP for production work and also print variable data on trim margins to identify jobs on the production floor. VDP is also used for sequential numbering of items in a job, like parking or event tickets,” explains Therese McGady, marketing associate, Aleyant. Stein points to PDF on demand emerging as a new VDP touchpoint. A link is included in a webpage or email to a personalized PDF document. “This is useful for scenarios such as creating a personalized book based on the visitor’s website choices—price proposals or insurance policy documents. Since the PDF is created on demand, when the visitor clicks the link, it reflects the most up-to-date data,” she continues. The general consensus is the adoption of these newest demands is slow and unsuccessful. “I don’t feel the MSP masses have fully adopted the depth of what can be done with VDP. From what I see, most still use names, and maybe one image, but don’t personalize based on data they could obtain or variable content based on responses. If they understand content marketing, the MSP would realize many pieces of content go into driving leads and they could all be variable and personalized—or virtualized at least,” says John Foley Jr., president/CEO, interlinkONE/Grow Socially. Additionally, the next generation of ultra-high-speed digital presses have the potential to change VDP by bringing higher volume, higher quality VDP to a range of applications. “In the document space, this could mean broader adoption of full color in the types of VDP applications that are dominated by monochrome and highlight color imaging today, but could also mean an expansion of what is produced using variable data printing, such as corrugated jobs,” says John Henze, VP, marketing, EFI Fiery. He predicts printing companies/ marketing service providers and packaging converters will adopt VDP processing tools and skill sets to maximize the capabilities of their newer presses. Trends like cloud-based software, big data, mobility, and interactive print affect the use of VDP solutions among print providers and MSPs. In the era of constant communication from smartphones, television, computers, and tablets, it is important to leverage all of VDP’s capabilities for targeted messaging. “These trends are coming at full speed. The recipients of communication now expect relevant information. They are bombarded hourly with information, and if you send them something irrelevant they can get angry. Our goal is to help customers build a relationship with the recipient by providing them the right information at the right time,” admits Pagliarello. In regards to cloud-based software, Foley questions why anyone would want to manage their own servers and networks and pay the expense. “The cloud is just as secure and easier to manage,” he continues. Big data in limitless. “There is so much more we can do with the amount of data available. It isn’t just company, first name, last name, and demographics like salary, amount of dogs or cats, etc. Look at what you can get from someone’s Facebook page today,” shares Foley. Big data has a major impact, providing marketers with a new realm of data points to use in direct marking decisions. “Other new developments, like the rise of mobile and the emergence of augmented reality speak to VDP’s role in the broader multi-channel communications market,” says Henze. Interactive print consists of many things. Perhaps the most well-known and frequently used are quick response (QR) codes. McGady points out that printers now consider QR codes as standard in everyday production. According to Stein, with trends like cloud-based software, big data, mobility, and interactive print, print providers and MSPs can now bridge their print and digital channels and track results and response rates in real time. “This bi-directional tracking aspect is critical. It gives marketers a better understanding of how their campaigns and strategy perform over time and allows the consumer to talk back to the brand,” she shares. Cultivating data properly is one of the biggest obstacles MSPs face when it comes deploying a successful multi-channel marketing campaign with VDP elements. Stein says that compared to other countries, the U.S. market has the most available and accessible data. “Marketers can buy or rent lists and target to recipients based on consumer demographics, financial segments, attitudinal and behavioral data, or even use geo fencing technology for location-based marketing,” she explains. “There is so much data today that the better companies embrace the need and deploy an expert as part of the process. The availability and accessibility of business data is there. It is up to the organization to capitalize on the information,” agrees Foley. The real challenge is having an expert with the time to mine through data and put it to proper use. A MSP may have the data expert on staff, but see them as a prepress person or a graphic designer. “These are real positions that can help the MSP make more additional revenue, but having a part time approach won’t do it,” says Foley. “Most companies do not have the necessary data to trigger personalized marketing messages and collecting this data takes time,” shares Pagliarello. Vendors share how their VDP solutions have evolved to support trends like cloud-based software, big data, mobility, and interactive print or demands for more reporting and tracking capabilities. Aleyant added support for QR codes and also data and image merging including merging text into body text messages. It is also in the process of adding sequential numbering capabilities and the ability to see an instant preview. EFI has worked to simplify many composition aspects of VDP with Fiery FreeForm. It is built into every cutsheet Fiery server to eliminate the learning curve and need for additional software. EFI has focused on making its Fiery DFEs faster so variable data processing doesn’t become the choke point in production. interlinkONE’s fulfillment and marketing software solutions exist in the cloud so customers do not need a separate IT suite. The result is a reduction in cost by outsourcing platforms to the cloud. “We have always had a print and digital mindset. When you are doing a VDP campaign, do it for offline and online companies. Over the years, this function may have grown, been further developed, etc. But at the end of the day this print and digital mindset has always been there. We have customers and customers’ customers all using VDP components on a daily basis,” explains Foley. Konica Minolta offers its customers the option to purchase both emails and mailing addresses inside its XMedia Platform. The company also runs personalized campaigns to collect prospects and customer preferences for use in future campaigns. “We have and continue to enhance our software with additional features and ease of use. Because most MSPs and print providers do not have the staff to run sophisticated software, we have created turnkey campaigns and supply both technical and strategy support for our MSPs and print providers,” says Pagliarello. XMPie’s print and digital media touchpoints are driven by its PersonalEffect personalization and composition engine. “This means that our customers can create and automate omni-channel customer experiences or journeys that guarantee a consistent synergistic view of the customer over time and across touch points—this is highly effective in engaging consumers and improving overall ROI for marketing,” shares Stein.